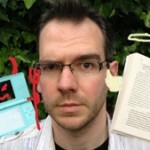 Tom Clempson » Reluctant Readers, Really? I’ve been a naughty boy. It has been 7 weeks since my last blog post (at least0! I have written some posts in that time, but the gap seemed so large that I scrapped them because I felt I had to come back with something a little bit bigger than my usual crap, so I’ve gone ahead and written something that I’ve wanted to write about for months now. 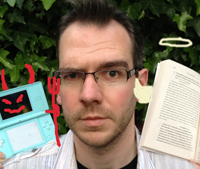 When I wrote One Seriously Messed-Up Week… I had no idea I was writing for reluctant readers. I had no idea I was writing for young adults, that I was writing for boys, or that I was even writing a book really (or at least a book that anyone was ever going to read). The term ‘reluctant reader’ was completely new to me, but the sad thing is – I didn’t need it explaining. In a world* where girls continually outshine the boys academically, it seems depressingly obvious that boys should also be the ones who don’t read for fun. My aim here is to start some kind of discussion (and yes, I am aware that my blogging absence may have lead to a sharp drop in my already limited blog-reader numbers, which may result in me having this discussion with no one else but myself, but I’m okay with that). I come across a lot of people (sometimes teen boys, but more often than not it’s their mums) who congratulate me on writing something that they/their son has actually picked up and read. The mums then go on to explain how they managed to get their son to actually open the book in the first place (usually using some kind of reverse psychology trickery, or just by simply leaving the book lying around until curiosity gets the better of them, they read the first word, then they disappear to their bedroom to giggle about rude things in private). THIS is the part that really interests me. Are you a reluctant reader? Did you used to be? Do you know one? Or, like me, are you a very eager reader, but rarely get the chance to actually commit to anything (due to either lack of time or crapness of book)? If so, what would/did/does finally get you/them to pick up a book? It makes sense that people who already read will continue to do so. But how do you draw in the ones who aren’t bothered? And why would they be bothered when there are so many other alternatives to entertain them? Internet, movies, gaming, sports, TV… Don’t books just seem a bit slow and hard work in comparison? What’s the selling point? I’d love to hear your ideas on this, not because I’m a publicity hungry, money-craving author, desperate to know how to sell more books (if I was then surely I’d drop what I currently do and start writing dark romance/dystopia for girls, NOT that people who do write those genres are! Just… oh, you know what I mean) but because this is a genuine interest to me. It’s a problem that I want to solve, an itch that I need to scratch. It’s almost becoming my hobby, thinking about this. So, please, how would you suggest we get reluctant readers to pick up a book (and read it)? *not the whole world, but most of it. Hey Tom! Nice to see you blogging again. Sorry I’m a little late! I used to be a reluctant reader. What got me reading? Initially, Harry Potter. My Mum and Dad bought my brother and I the first three books one Christmas when I was about 12/13. I didn’t read, so I was kind of diasppointed in getting them. However, after a few months, I felt guilty that I had been bought this present that was just sitting there gathering dust, so I grudgingly picked up the first book, just so it wasn’t a waste. And I fell in love with everything Harry Potter. However, after finishing the third, and waiting for the fourth, I was still a reluctant reader. Sure, I liked those books, but why on earth would I enjoy reading anything else? It was reading, and reading is boring. But my Dad would go on and on to me about these books he has, that I would love if I loved Harry Potter, because there are sorcerers and sorceresses, gods and fighting and wars and magical orbs, and political intrigue and prophecies. Meh. Not my cup of tea. But he wouldn’t shut up, so I relented, and picked up Pawn of Prophecy by David Eddings. Again, I fell in love, but this time, not just with the story, but with the feeling of awe and wonder that came with reading and discovering, well, my imagination. So guilt and an ear-bashing got me reading, and I haven’t looked back. My brother, however, doesn’t read. He read The Curious Incident of the Dog in the Nighttime at school, and really liked it – but wouldn’t read for fun outside of school. He heard about the first Skulldugery book and thought it sounded really good and had our parents buy it for him – he’s not yet finished it. A few years ago, I can’t remember why, but something on the internet sparked his interest in The Great Gatsby, which he now has – again, he’s not yet finished it. I think his problem is he just hasn’t yet found his book yet, the book that will hook him in enough to keep turning the pages. Knowing him and the things he likes, I keep suggesting funny YA novels for boys to him, your’s included, or sci-fi or geeky ones that somehow have something to do with gaming. He has no interest – but I think that’s more to do with being ridiculous and stubborn, and refusing to read anything his older sister recommends to him, no matter how good he refuses to admit it sounds. f he stumbles across a book that sounds like it may good by himself, he’ll pick it up. I just don’t know what will stop him from putting a book back down again. It’s sad, because he’s missing so much. I don’t know what the answer is, but I think there was something awesome about how he loved the book he read at school. Maybe that’s something that should be looked at – books that are studied at school are a mix of books from way back when and contemporary books for the age group. Like comparisons. Maybe Dicken’s Oliver Twist with Nicholas Dane by Melvin Burgess. I’ve not read either book myself, but from what I’ve heard of Nicholas Dane, I think they would work as two stories to be compared. Or something like that. Bring in stories written today that are likely to appeal to reluctant readers, and make it compulsory that they read them – for exams/coursework, what have you – along with the normal stories they have to read. If the books they have to read for school are books they may end up enjoying more than the ones currently studied (more than just one book, like with my brother), I think there may be more chance that they’ll pick up a book outside of school and actually read it. Maybe. Hopefully. Oh, I rambled a bit. Reading it back, I see it needs editing. And I can go on a bit sometimes. Sorry, lol. But I look forward to this blog post reply! Whoop, I inspired a blog post, kind of! After I finished my first book I had the world by the oytser. I was such a newbie and had no clue so everything was fresh and new. I also wasn’t on the blogs yet and had no idea what I was doing.Now that I’ve been through it and gotten my share of rejections it’s not any easier but at least I learned a few tricks of the trade.1) Make sure your query is as good as it can get. Send it out to sites, to beta’s to other writer’s for help.2) Go through your agent lists and categorize them A-B-C. Send out to the C’s first, that way if they reject you, you’re not wasting the A’s or B’s time. Which if they all come back as rejections you have time to rewrite the query or first few chapters.3) If you should get requests from the C’s then by all means start sending to the B’s and A’s, however4) Don’t send everything out all at once. 7 -10 at a time. When the requests come in, pick 3 from B and 4 from A and then send those.Rejections hurt there’s no doubt about that but this is part of the business. As soon as the queries go out, find another project to start. Not only will it semi keep your mind off the queries, you’ll have started another book so if you do get the call you can tell the agent you have something in the works. Best of luck.Sorry for the rambling but it’s what I do. Fantastic advise! Thank you Dusan.